Johns Hopkins engineers have invented a lab device to give cancer researchers an unprecedented microscopic look at metastasis, the complex way that tumor cells spread through the body, causing more than 90 percent of cancer-related deaths. By shedding light on precisely how tumor cells travel, the device could uncover new ways to keep cancer in check. The inventors, from the university’s Whiting School of Engineering and its Institute for NanoBioTechnology (INBT), published details and images from their new system recently in the journal Cancer Research. Their article reported on successful tests that captured video of human breast cancer cells as they burrowed through reconstituted body tissue material and made their way into an artificial blood vessel. This dish houses a lab chip that Johns Hopkins engineers built to gain an unprecedented closeup view of how cancer cells enter the bloodstream to spread the disease. Photo by Will Kirk/Johns Hopkins University. With this novel lab platform, Wong said, the researchers were able to record video of the movement of individual cancer cells as they crawled through a three-dimensional collagen matrix. This material resembles the human tissue that surrounds tumors when cancer cells break away and try to relocate elsewhere in the body. This process is called invasion. Wong also collected video of single cancer cells prying and pushing their way through the wall of an artificial vessel lined with human endothelial cells, the same kind that line human blood vessels. By entering the bloodstream through this process, called intravasion, cancer cells are able to hitch a ride to other parts of the body and begin to form deadly new tumors. 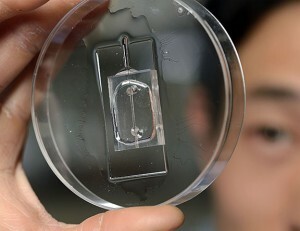 To view these important early stages of metastasis, Wong replicated these processes in a small transparent chip that incorporates the artificial blood vessel and the surrounding tissue material. A nutrient-rich solution flows through the artificial vessel, mimicking the properties of blood. The breast cancer cells, inserted individually and in clusters in the tissue near the vessel, are labeled with fluorescent tags, enabling their behavior to be seen, tracked and recorded via a microscopic viewing system. 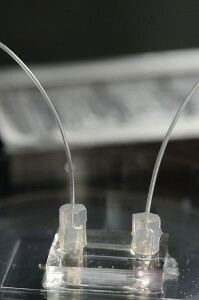 Tiny tubes connected to the chip carry a fluid that behaves like the bloodstream, allowing the Johns Hopkins researchers to study how metastasis occurs. Photo by Will Kirk/Johns Hopkins University. Wong’s doctoral advisor, Peter Searson, the Joseph R. and Lynn C. Reynolds Professor of Materials Science and Engineering and director of the INBT, said his graduate student took on this challenging project nearly five years ago—and ultimately produced impressive results. This improved view should give cancer researchers a much clearer look at the complex physical and biochemical interplay that takes place when cells leave a tumor, move through the surrounding tissue and approach a blood vessel. For example, the new lab device enabled the inventors to see detailed images of a cancer cell as it found a weak spot in the vessel wall, exerted pressure on it and squeezed through far enough so that the force of the passing current swept it into the circulating fluid. Knowing more about this process could unearth a key to thwarting metastasis. Next, the researchers plan to use the device to try out various cancer-fighting drugs within this device to get a better look at how the medications perform and how they might be improved. Andrew Wong, left, a materials science and engineering doctoral student, developed the metastasis research device with his faculty adviser, Peter Searson. Photo by Will Kirk/Johns Hopkins University. The new lab device to study metastasis is protected by a provisional patent obtained through the Johns Hopkins Technology Transfer office. Wong’s work has been supported by an INBT training grant. Development of the cancer research device was supported by National Institutes of Health grant number R01CA170629.